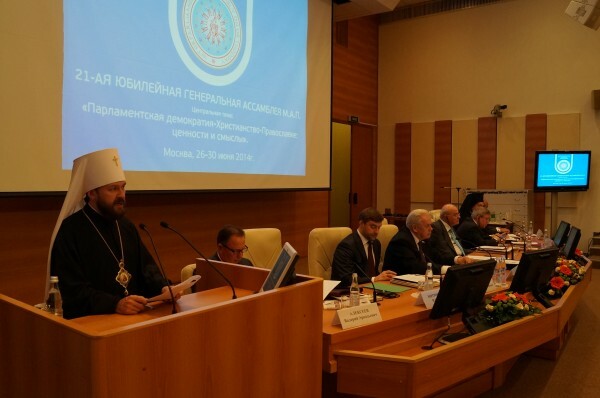 June 26, 2014 – the 21st Inter-parliamentary Assembly of Orthodoxy has opened in the State Duma under the theme “Parliamentary Democracy – Orthodoxy: Values and Meanings”. The opening was attended by State Duma chairman S. Naryshkin, Council of the Federation vice-chairman A. Torshin, IAO general secretary and Greek MP Anastasios Nerantzis, DECR chairman Metropolitan Hilarion of Volokolamsk, Patriarchate of Constantinople representative to the Council of Europe Metropolitan Emmanuel of France, State Duma vice-chairman S. Zheleznyak, IAO international secretariat adviser Constantine Migdalis, International Foundation of the Unity of Orthodox Nations president V. Alekseyev, DECR vice-chairman Archpriest Nikolay Balashov, and other officials. The IAO president S. Popov greeted the forum, saying, “Symbolically, the twentieth year of the Inter-parliamentary Assembly of Orthodoxy began with a session in Athens, the capital of Greece, and ends in Moscow, the capital of Russia. Twenty years ago, our two countries laid the foundations of inter-parliamentary cooperation between the countries of the Orthodox area”. The Assembly stands for the protection of Christian communities in various part of the world and the preservation of spiritual values, he stated. Mr. Naryshkin stated that the parliamentary diplomacy is capable of offering an effective instrument for overcoming today’s global problems. Speaking about the tragic events in Ukraine provoked by a political crisis, he cited His Holiness Patriarch Kirill of Moscow and All Russia as saying, “It is only the devil who can celebrate a victory when brothers meet in battle, killing each other, inflicting wounds, weakening the power of the people”. He welcomed the first steps taken to de-escalate the conflict. “I very much hope that the lessons of the Ukrainian confrontation will be learnt not only in this country but in all the world” he said reminding the assembly of hundreds of civilians who have become victims of the conflict. “I trust that the voice of the Inter-parliamentary Assembly of Orthodoxy will resound more and more louder and clearer and will play its role in solving urgent problems existing in various spheres beginning from the careful conservative attitude to the traditional lifestyles of nations to the protection of the rights of fellow Christians who are persecuted in various parts of the world, especially in the Middle East and North Africa”, he said. Another massage of greetings was brought by the IAO general secretary A. Nerantzis. Mr. Torshin read out a message from the chair of the Council of the Federation, Ms. V. Matvienko. His Holiness Patriarch Kirill of Moscow and All Russia addressed the assembly through a video, saying “The present meeting is a visible sign of the unity of Orthodox nations, based on a common faith”. The faith impels a Christian not to be an indifferent spectator of processes taking place in the world but to take part in the building of society and relations between individuals. “Today we become witnesses of growing nihilism and rejection of moral principle in personal, family and social life, which leads to all-permissiveness in people’s behaviour. All this threatens to undermine the spiritual foundations of the modern civilization. In a situation of growing economic, social and political instability, moral relativism and development of new hotbeds of tension, we have a special mission to bear witness to the gospel’s foundations of common human life and to the need for mutual aid, self-sacrifice and peace service”. Metropolitan Emmanuel read out a message of greetings from His Beatitude Patriarch Bartholomew of Constantinople. Metropolitan Hilarion of Volokolamsk, in his address to the assembly, said in particular, “The voice of many millions of Orthodox believers living in various parts of the universe should be heard and taken into account in discussions on pressing problems on the international agenda. It is what the Assembly as a mouthpiece of the values of the Orthodox world should contribute to. This organization is also called to demonstrate to sceptics that there are factors of international relations other than stock market indexes and investment climate. The non-material dimension of human life is primary and therefore should be decisive in international relations. I mean first of all moral ideals and meanings”. Messages of greetings were also brought from the Hellenic Parliament speaker V. Meimarakis, Pan-African Parliament president S. Kebzabo, and the World Council of Churches representative the Rev. Dr. D. Buda. The 21st Inter-parliamentary Assembly of Orthodoxy will last several days. A joint declaration will be signed by ministers of culture in the IAO member countries.